Today, Nintendo announced its first annual operating loss in its history as a public company. Sluggish Wii sales and a strong Japanese yen hurt Nintendo—not to mention a rocky rollout for the Nintendo 3DS. The game maker chalked up a US$455.9 million operating loss for the 2011 financial year. "What went wrong was that sales of the 3DS didn't take off as we expected," Nintendo President Satoru Iwata said (via Bloomberg). "The stronger yen against the euro was also another reason." The Nintendo 3DS is being sold below cost due to a large pricecut. However, Nintendo stated that the 3DS will cease to be sold below cost sometime later this financial year, making the handheld even more profitable for the Kyoto-based game company. 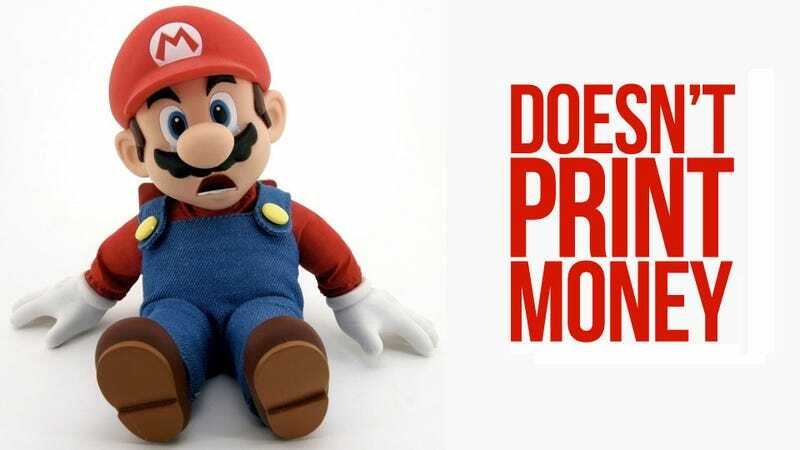 Nintendo is also forecasting a profitable April 1, 2012- March 31, 2013 (aka their 2013 fiscal year), thanks to strong 3DS sales and the upcoming Wii U. The game maker is predicting an operating profit of $429 million for the year starting April 1, 2012. Warm up those money printing presses, Nintendo!